shape and wingtip floats. The two occupants sit in tandem in an open cockpit with conventional controls, but without any instruments. 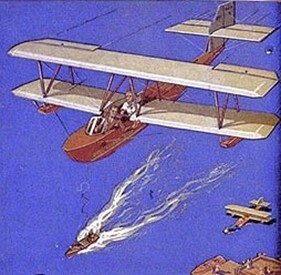 The normal method of launching was from behind a motorboat using a towrope attached to a bridle which attached to either side of the nose of the aircraft. Release hooks were used to drop the towrope when a sufficient altitude had been reached by glider. The glider boat was intended strictly for recreational use and was motivated by the sudden popularity to fly that resulted from Charles Lindberg’s 1927 solo flight across the Atlantic Ocean. The aircraft was constructed using a wood spar and metal ribs covered with doped aircraft fabric. The hull is made of duralumin. In its day it was sold for $595 each. Thirty aircraft were built before the company went out of business due to the Great Depression. Wingspan 31 feet.—Length 22 feet.—-Empty Weight 250 pounds. Gross Weight 600 pounds.